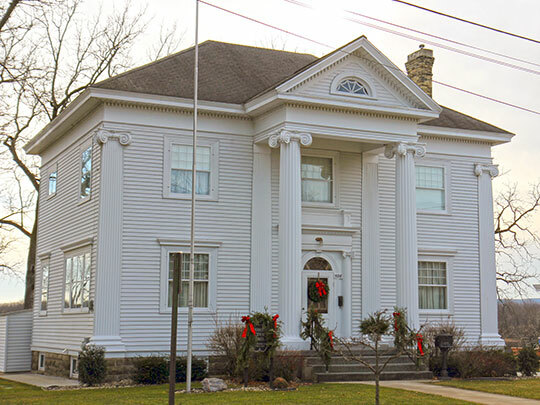 Portage City Hall is located at 115 West Pleasant Street, Portage, WI 53901; phone: 608-742-2176. Photo: Zona Gale House, ca. 1906, 506 West Edgewater Street, Portage, WI. :isted on the National Register of Historic Places in 1980. Photographed by User:Royalbroil (own work), 2014, [cc-by-3.0 (creativecommons.org/licenses/by/3.0)], via Wikimedia Commons, accessed June, 2016. The City of Portage  and its surrounding areas, make up a community rich in natural amenity and history. The Native American tribes that once lived here, and later the European traders and settlers, took advantage of the lowlands between the Fox and Wisconsin Rivers as a natural "portage," which eventually lends itself to the name of the community, taken from the word the French fur traders used to describe the place, "le portage." As a portage, this community developed as a center of commerce and trade, and later, a canal was constructed to facilitate this trade. When the railroads came through, it continued in this role. By the end of the 17th century, the Fox-Wisconsin waterway, linked at The Portage, served as the major fur trade thoroughfare between Green Bay and Prairie du Chien. In 1828, the federal government recognized the strategic economic importance of The Portage and built Fort Winnebago at the Fox River end. Development of the state's resources necessitated the movement of bulk cargo to the Great Lakes. Navigated by canoes for over 100 years, the Fox-Wisconsin waterway underwent improvement for steamboat traffic beginning in the late 1830s. The improvement linking Portage and its canal to the lower Fox industrial cities of Neenah, Menasha, Appleton, Fond du Lac and Green Bay were sufficient to carry barges of lumber and bulk farm goods by the 1850s. Shifting sand bars defeated efforts to improve navigation of the Wisconsin through a system of wing dams. These efforts were abandoned after 1886. In 1857 and 1858, the railroad linked Portage to the major commercial centers of Milwaukee and La Crosse. The Chicago, Milwaukee & St. Paul constructed a regional railroad center in north Portage in the 1860s. In 1877, the Wisconsin Central connected south Portage to Ashland and Milwaukee. These connections assured Portage its role in the commercial development of the state and eventually absorbed the bulk cargo carried along the canal. Portage is the Columbia County Seat, located in the southern portion of central Wisconsin. In addition to its historical connection to the Wisconsin and Fox Rivers, and the railroads, Portage is located along Interstate 39 and U.S. Highway 51. Regional traffic headed to northern parts of Wisconsin typically exits Interstate 90/94 onto Interstate 39-Highway 51, traveling through Portage. Recognizing this important juncture, Portage adopted the motto, "Where the North Begins." Its location along the Wisconsin River places Portage in the low lying area with many wetlands within and around its borders. A portion of the area lies within floodplains. The natural setting of the River and wetlands provides both ample natural resources and a beautiful setting, as well as challenges to growth and development. Recent completion and certification of a levee along the Wisconsin River removed portions of the City from floodplain designation. Dams along the Wisconsin River often result in low flow conditions on the River during summer months, limiting access to the River for boating and recreation. Schreiber|Anderson Associates, Inc for the City of Portage, WI, City of Portage, Columbia County, WI Comprehensive Plan, 2008, www.portagewi.gov, accessed June, 2016.